Communication is a process of transferring information from one person to another. It is commonly defined as ‘the imparting or interchange of thoughts, opinions, or information by speech, writing, or signs’. It is a two way process in which there is an exchange of information towards a mutually accepted goal or direction. Organizational communication is a channel for flow of information. This includes activities of sending and receiving messages through various layers of authorities using different message systems and discussing various topics of interest with the employees of the organization. 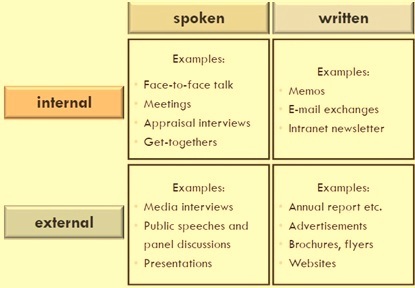 Organization communication is shown in Fig 1. In present day scenario, communication is important for the functioning of an organization as well as for its success. The organization’s executives traditionally spend the majority of their time in communicating in one form or another (meetings, face to face discussions, inter office memos, letters, reports etc.). Today the necessity of communication is felt more and this necessity has engulfed most of the employees in the organization. The need of communication has increased in recent times since today’s work processes emphasize greater teamwork amongst the employees. Also for achievement of the short and long term objectives all organizations have to meet the challenges of internal and external communication. Work processes are very complex which need close coordination among the employees. The pace of work is very fast. Employees are lesser and distributed. Distributed work processes are more common. Knowledge and innovation are more critical to the competitive advantage of the organization. Key distinctions with respect to communication in an organization involve (i) levels (ii) formal versus informal (iii) direction (vertical, horizontal and diagonal) and internal versus external focus. Levels – Communication is usually divided into various levels which includes (i) interpersonal communication (ii) group level communication (iii) organizational level communication (iv) inter organizational level communication and (v) mass communication. Interpersonal skills of all the employees of the organization are important if the organization is to improve its communication base. Further the skill to receive message is as important as skills associated with sending messages. There is a shift is taking place in the organizational communications which are increasingly getting focused on meso (group, team, organizational and inter organizational) level of communication in place of micro level. Further computer based communication has flaming potential and may result into negatively charged communication exchanges since senders are ignorant of ‘the social context and free to express themselves’ while the receivers donot have this advantage. Formal versus informal communication – In the past the major focus of the organizational communication used to be formal top down communication especially in large bureaucratic organization. At that time informal communication, normally associated with interpersonal, horizontal communication was seen as a potential hindrance to effective organizational performance. This thinking changed and dynamic and non formal, if not informal, communication became more important for ensuring the effective conduct of the organizations. The organizational culture and climate was managed to avoid any opposition between formal and informal communications. More recently, organization communication focus on the growing dependence on dynamic computer facilitated communications that are neither formal nor informal. Today formal and informal methods of organizational communication are becoming less important since many newer channels of communication are now available to the organizations which are neither totally formal nor totally informal. Direction – Organizational communication is characterized as vertical, horizontal or diagonal. During earlier days more emphasis was given to vertical communication. Soon the emphasis shifted to lateral or horizontal communication. Diagonal communication in the organizations is a recent development. (i) Vertical communication occurs between hierarchically positioned persons and can involve both downward and upward communication flows. Downward communication is more prevalent than upward communication flow. However downward communication results into low level of satisfaction amongst the employees. Upward communication is even lesser level of employee’s satisfaction since the employee has the fear of reprisal and has feeling that his idea/concern is filtered as it is transmitted upward. Also in upward communication, managers give impression that they donot have time to lto the employees. (ii) Lateral communication involves communication amongst employees who do not stand hierarchical relation to one another. The recent trend of flattening of the organization has enhanced the importance of the lateral communications. However with growing importance of the teams in organizations, more attention is now being directed at communication between team members. (iii) Diagonal communication – Diagonal communication refers to communication between employees located in different functional areas. Although both vertical and horizontal communication continue to be important, these terms no longer adequately capture communication needs and flows in most modern organization. The concept of diagonal communication has been introduced to meet the new communication challenges associated with new organizational forms. Externally oriented communication – Externally oriented organizational communication is the exchange of information and messages with those who are outside the organization’s formal structure. This may be with public, customers, suppliers, local bodies, statutory authorities, community organizations and investors etc. The external communication can be through formal channels or through informal contacts. The goals of the external communication are to facilitate cooperation with the external agencies. It is important to the organization since it determines the public image of the organization. A variety of communication channels are used for external communication and these include face to face meetings, electronic communication technologies as well as print and broadcast media. Various tools used in organiational communication are shown in Fig 2. Very Useful article. Very important in today’s scenario where stiff competition in the market and communication within the organization and outside is the key role in growth of a company and its executives. Very effective and important in today’s stiff market competition. Good communication helps within the organization to grow. Clarity is the basic thing which helps each other to work efficiently, quickly, error free. Good communication within and outside i.e. marketing helps to escalate rather than step up.